For its price, it shouldn’t be surprising that the Chuwi Hi9 isn’t exactly a work of art. From certain angles, it looks pretty much like your average budget Android tablet. The construction is plastic all throughout, especially on the back. And, given enough force, that back will flex and break. It’s one saving grace as far as design goes is its face. No bezel-less 18:9 screens here, mind, but none of the completely flat and obscenely thick borders either. The Hi9 sports a “2.5D Arc” glass, its borders curving slightly at the edges, giving it at least a prettier appearance you’d mostly see on phones or premium tablets. The Hi9’s design is spartan, to say the least. No fancy ports, connectors, or buttons. On the right side, you have the power button and the volume rocker. On top you have a micro USB charging port, 3.5 mm headphone jack, and microSD card slot. That’s all that there is and nothing more. The speaker grille sits on the lower back, alone and facing away from you to do any good. It’s location also means you’ll be covering it with your hand most of the time when playing in landscape orientation. On paper, the Chuwi Hi9 definitely offers big bang for small bucks. The display alone is worth its price, an 8.4-inch LCD panel with a resolution of 2560×1600. That gives it a much higher pixel density than the nearest iPad mini 4 equivalent and even slightly higher than the iPad Pros. That said, the resolution also means that the Hi9 follows the typical widescreen, here 16:9, format of most Android tablets of yesteryears. In terms of memory, the tablet boasts of 4 GB of RAM, still atypical of budget tablets these days. Even more generous is the 64 GB of internal storage that can still be expanded with a microSD card slot. There are, however, at least two large blots on that spec sheet. The 5 megapixel rear camera and 2 megapixel camera are not only disappointing on paper, they’re even worse in practice. You might even be embarrassed to use those for a professional video call. Then again, almost no one takes tablet cameras seriously but, at this size, the Hi9 could have made for a slightly less obnoxious shooter. The biggest concern, however, might be the processor. No Qualcomm Snapdragon here. Instead, you have a MediaTek MT8173, an SoC specifically designed for tablets. For the technical details, it uses two high-performance Cortex-A72 cores and two power-efficient Cortex-A53 cores. For graphics, it has an Imagination PowerVR GX6250 GPU. It’s obviously not a powerful processor and its limitations easily show under heavy work loads. Fortunately, its average performance is within acceptable ranges. Its biggest flaw is not even its own. Chuwi has opted to use the MT8173 with a 2560×1600 screen, when the processor is advertised to handle up to 1920×1080 only. That mismatch may be to blame for some of the Hi9’s performance hiccups. On the software side, the Hi9 thankfully ships with an almost pure Android 7.0 Nougat (sadly not even 7.1.1). Little to no modifications and no bloatware. The one exception to the latter is an unfortunate one, however. Chuwi pre-installed ES File Explorer as its file manager. Once the darling of power users, it quickly fell out of favor after switching to an obnoxious and intrusive ad-laden model. Fortunately, it’s easy enough to disable and replace. When reviewing mobile devices and computers, everybody loves to see benchmarks. While their ultimate usefulness is still a matter of debate, they at least give reviewers and readers a frame of reference to compare one device against others in the market. Following that tradition, we ran some of the most popular benchmarks on the Chuwi Hi9 for good measure. The problem with any benchmark is that they only artificially test a device based on their own criteria. They can never really predict how a device will perform in your hands. For example, the Hi9 did terribly in all of the benchmarks, which can be expected from the device’s processor. In actual use, however, the tablet was able to stand on its own pretty well. Saving the gaming aspect for later, the Hi9 is able to handle most tasks with aplomb. It had no problem with video playback, using the right app, like VLC, to handle most file formats. Multi-tasking was also a piece of cake with that much RAM. Audio was loud and full, though it could have been better with front-facing stereo speakers. I was even able to comfortably use the Hi9 for work, like browsing and writing, with a little help from Bluetooth peripherals and Android Nougat’s split screen feature. All in all, this Chuwi Android tablet ended up being a very usable, multi-purpose portable computer, despite of the low expectations for having a MediaTek processor. Battery life is also commendable, though your mileage will, of course, vary. The 5,000 mAh pack was able to last nearly 30 hours with mixed use, including about 10 hours of not being used. And that’s with auto brightness disabled and the display set to 50% brightness, which, as we’ll soon find out, might be overkill at times. Under constant and heavy use, like for work, the Hi9 lasted about 7 hours before it needed to be plugged in. Fortunately, charging doesn’t take too long, about 2 hours from 1% to 99% if you leave it alone. It’s not terribly fast, but not terribly slow either. 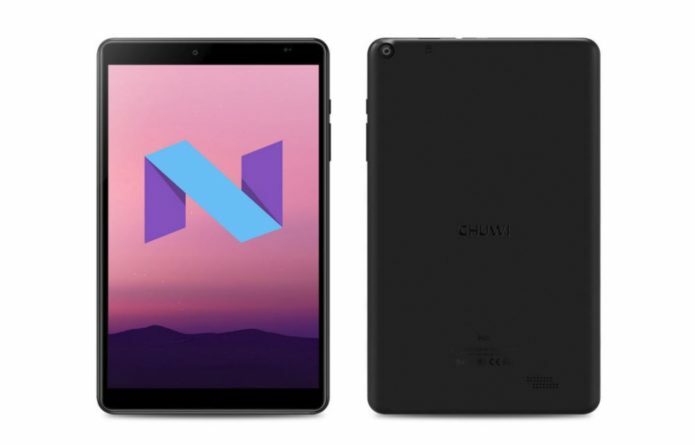 Chuwi bills the Hi9 as a gaming tablet and so it must be judged on that criteria specifically. Unfortunately, its grade is all over the place. Gaming uses more and slightly different resources compared to most other use cases. It also tests the hardware, particularly the processor, to its fullest. With few exception, Android games are designed and developed to work well on devices with constrained hardware like phones and, well, the Chuwi Hi9. Depending on the title, the Hi9 will run smoothly or stutter at times. It was able to handle Modern Combat 5 and Asphalt 8 Airborne with no problem, despite the games’ fast changing graphics. It did, however, sometimes choke on Injustice 2’s console-quality graphics. Part of the problem probably lies in the screen. Mind, it’s a very good one. Colors are vibrant and accurate and the brightness is so high that, unless you’re under direct bright outdoor light, even pushing the brightness slider to the lowest will be sufficient. Viewing angles are also good. This makes the Hi9 great not just for gaming but also for watching videos and reading ebooks or comics. Unfortunately, the high resolution might be taxing the processor far more than it’s capable of, an unfortunate tradeoff. One other thing to note is that the Hi9 tends to run quite hot when running resource-intensive games like Injustice 2. Not burning hot, but it could become uncomfortable after some time. Especially since the heat is isolated at the upper left side of the screen when holding the tablet like a game controller. On that note, you could also connect a game controller, mostly Bluetooth ones, though most Android games were designed to be used only with a touch screen. Therein actually lies yet another caveat to the Hi9’s gaming chops. Actually for any Android tablet for that matter. Most Android games presume a screen size no bigger than a phone, and you might find yourself uncomfortably reaching for the middle of the screen with your thumb for games that require you to touch or swipe near the middle of the display.